Congenital malformations are a major cause of mortality and morbidity in the prenatal, perinatal, and neonatal periods. Three percent of newborns have a single major malformation and 0.7 % of newborns have multiple abnormalities. The majority of pregnancies in which major congenital abnormalities occur result in miscarriage, spontaneous fetal loss, or termination of pregnancy. With significant advances in imaging modalities and genetic testing capability, the identification and precise diagnosis of syndromic congenital abnormalities is occurring increasingly. 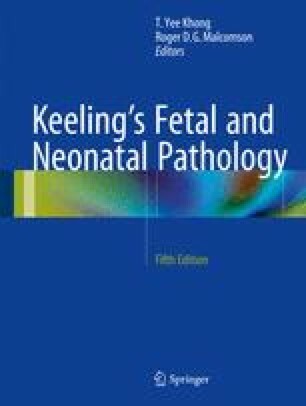 Significant resource allocation and a multidisciplinary approach to fetal autopsy that involves pathologists, radiologists, clinical geneticists, microbiologists, and obstetricians have led to a high rate of case resolution for families experiencing the trauma of pregnancy loss or termination. EUROCAT. Eurocat special report: a review of environmental risk factors for congenital anomalies. EUROCAT Central Registry, University of Ulster; 2004; Available from: http://www.eurocat-network.eu/pubdata/.